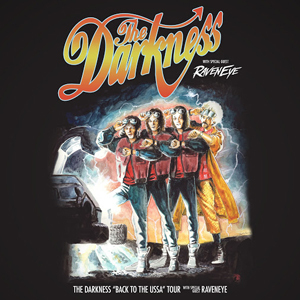 On the heels of their Fall 2015 North American tour, mythological UK rock band THE DARKNESS - Justin Hawkins (vocals, guitar), Dan Hawkins (guitar), Frankie Poullain (bass) and Rufus Taylor (drums) – are set to reignite American stages on the Back To The USSA tour kicking off on April 8th in Santa Cruz, CA. The trek in support of new album Last Of Our Kind, promises to reinforce THE DARKNESS’ reputation as one of the mightiest live bands in the world. Back To The USSA tickets are on sale HERE. Last Of Our Kind, released June 2015 via Kobalt Label Services, is an album of unparalleled beauty and power bursting with exhilarating riffs, magnificent melodies and very high voices - as you would expect of these rock mega-gods.